Did not finish it. I prefer a full movie and not these weird little shorts. A bit of a strange beast. Uneven and sometimes tedious the segments succeed and fail to varying degrees. But westerns do make for mighty fine storytelling, so saddle up with your partner and find a story you like. Anthology as a tour through the usual favorite toys and puns of the famous pwd brothers. Thespians are cattled carefully, the camerawork is gobsmacking gorgeous, the western locations a hoot, all the technique is finely tuned, and as disparate as the stories may be, they do come together as a sort of whole. Alas, no politickering, so the Academy missed the boat. 768887. Despite being a big Coens fan I had my reservations about this, and naturally I liked it completely. Every different story drew me in in a different way and it's hard for me to even pick a favorite because they are so unique. Pretty crazy it can start with goofy musical cowboy absurdism and end with some heavy existential bleakness and still feel like it all fits together. I shall never doubt my love of the Coens again. I found this pretty damn enjoyable. 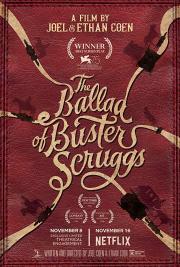 I like these kind of anthology films, and I love the Coens’ sensibility, so it was a guaranteed success for me, really. I liked each of the stories to different degrees - some were funny, some were sad, some were thoughtful, and all were good. The performances were really nice, the cinematography was beautiful, and there was a nice musical element to the film. Not among the top tier Coen brothers films, but very watchable. The Coens pay homage to classic western tropes, but add their own spin. Nelson is a Roy Rogers/Gene Autry singing cowboy that inhabits a spaghetti western. Heck and Kazan are characters from a John Ford film spouting the Coen's distinctive dialogue. Like a lot of their more personal films, it feels so immersed in classic Hollywood that it may not appeal to a wide audience. As an anthology, the film's appeal changes from story to story. The opening story is bright and melodic, with a cartoonish quality. The second has a bland James Franco in a dead-end story. The third and fourth feature little dialogue but are interesting in their own way. The fifth and sixth feel like typical Coen Brothers stories--snappy dialogue, distinct characters--with the last story being the most engaging. All six are well photographed and directed, but the whole is the sum of its parts. Some stories are stronger than others-- it's a film that seems like it's asking film/folklore students to write a paper about it. Chock-full of that signature Cohen-brothers irony, but with rare moments of poignancy, too. remembrance of things past... i loved shakespeare boy and amazed by how the conversations in the last story are written... as if it is pointless to make a Western film, but it is rather just a film about humanity. The Coens have always had a special touch, but putting their writing into an anthology movie seems to limit their ability to really shine. Some of the segments are awesome, some come off uninspired, and most of them felt underdeveloped. Yet the whole is still a perfectly entertaining movie, with a few decent chuckles. An anthology film like this seems suited to a service like Netflix, where you can drop in and drop out at your own leisure. Not sure about the general consensus, but the first two tales are dynamite, third and fifth are overlong and lack a distinctive purpose, the fourth is simple, yet beautiful and features a stunning portrayal of this piece of America, and the sixth suitably wraps it all up. All in all, not a bad piece of home-viewing cinema. Not the humor I'm used to. Strange and odd. There's a danger in doing anthology movies but the Coen brothers pull it off wonderfully. Each story has a different vibe and theme but somehow maintains that coen bros style.There obviously some stories better than others but there isn't one even close to being bad. The Coens love making a variety of films. Buster Scruggs puts that on clear display. Westerns displayed in several different styles. each story has such great flow to it. I personally would love to see this on a larger scale. Explore other genres with a series of short movies about that genre. I'd be psyched. The Coens are still some of the best storytellers out there in my opinion. Awesome performances from everyone. Gave up after the second installment, so I'm not sure what else they had to offer. Really wish I made it to Waits section, since he's the only reason I cared to begin with. Makes sense why this is on Netflix instead of being a real movie.